Online Music Store How To Get An Amazon Prime Membership For Free? Like most music streaming services, Amazon Prime Membership has a free trial period in which you get access to prime music, prime video, two-day shipping for free, and the Kindle Owners’ Lending Library. The 30-day trial does not necessarily mean the game is over, not even close, after the trial, you can open another new account and keep ordering. However, you might require a different email address which is not a problem for most shoppers. If you happen to forget to renew the prime membership after the trial period, Amazon will email you another free trial opportunity. It may not be a convenient way to save but Amazon has multiple trials to pass around. 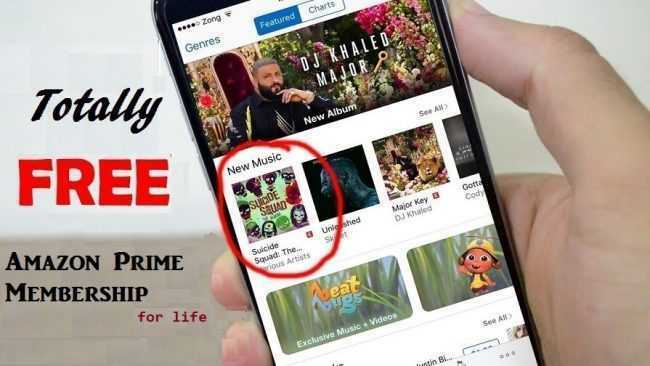 This just one of the several ways you can have Amazon Prime Membership free and enjoy amazing hits and videos from your favorite artists, create playlists and station to share with other users and much more. Beware of tricks that can land you in trouble or crash your system; some are not worth risking you or your PCs life. Below are the various ways and tricks to avoid paying $99 to play and listen to numerous tracks courtesy of Amazon prime. For a current Prime member whose package doesn’t arrive in two days, hold Amazon Inc responsible for it and get a free Prime extension. Chances are they will offer you something else to keep the peace. There are more ways to get free shipping without paying Amazon Prime. Check out Sprint wireless for the smartest way to score youa free Prime membership. With the Amazon Better Choice XXL plan, both new and existing Sprint customers can have a free 12-month Amazon Prime Membership with the newly launched cell phone plan. It’s even better if you are already with Sprint. Otherwise, sign up viawww.sprint.com or go to the nearest Sprint store. The process is simple and once you are completely registered, you can enjoy Amazon Prime and of its benefits. On top of that, you get access to pre-loaded or downloaded applications to easily get Prime content on compatible gadgets like smartphones. The idea of combining Sprint with Amazon Prime’s series of high-quality entertainment seems to be a spectacular thing for Amazon customers all over. While most of the way appears to be complicated, this one is very simple and readily accessible. It might come as a surprise to many Amazon shoppers, but with a new American Express Card, you are eligible for… Amazon Prime free for a year ,especially the Blue Cash Everyday Card which has no annual fee and some pretty awesome services you might enjoy. To check for eligibility, call AmEx or redeem your promotional code that gives you the same-1 year Amazon Prime access. In case you are a prime member already, your free year automatically begins once your current membership expires. If this doesn’t work, try the other ways. For six months, you access Amazon Prime at its best with a student account. All you need to be licensed is a .edu email address, an Amazon account, and be enrolled in a college located within one the District of Colombia, 50 U.S countries, or Puerto Rico for at least one course. Except for Prime Music and the Kindle owners’ lending Library, you will access everything else Amazon Prime has to offer. Also, Prime student hack comes with another free 6-month membership. Once the trial ends, you will have to sign up for Amazon Prime for a few dollars to keep enjoying their services. In India, they have found a way around activating Amazon Prime India membership subscription. Get your product in 1 or 2-day free delivery but for this to work, place unlimited orders at Amazon through this membership and chose your method of payment as cash on delivery. You know that refunds and damages are taken care of by Amazon. Once your prime subscription is activated, and you get Amazon Prime order at your place, cancel it. Chances are your Prime account will be deactivated in which case you can reactivate and get free delivery on Amazon products. Another way is to use fake name generators for credit details that don’t exist, go to Amazon Prime Subscription Page and press the “join prime today” button where you sign in and register. Enter shipping details with the credit card content you attained from the fakenamegenerator.com and get a prime membership for a few hours. Don’t waste time,place your order immediately which will be successful before they know what hit them and you get yourself free delivery on any product. These are just a few trick learned by users now and then but if you have an idea that hasn’t been discovered.